Every year multiple Judas Iscariot effigies are burnt in Mexico as a part of a Catholic Easter-time ritual. This time US presidential candidate Donald Trump was among them. The Burning of Judas festival is a Catholic celebration, once practiced throughout Europe. Nowadays people from only few countries keep up the tradition of burning, hanging and exploding effigies representing Judas, devils and unpopular political figures. The festival took place on Saturday, when thousands of Mexicans left their homes across the country to show Judas who’s the boss. It wasn’t very surprising that this year the effigies of Trump were “special guests” at the party. The Republican is notorious for his anti-migrant remarks, describing Mexican immigrants as drug traffickers, rapists and criminals. “We are going to burn Trump now because we don’t like him. He speaks ill of Mexicans,” said Felipe Linares, the maker of a six-foot-tall (2 meters) doll as quoted by AFP. "Since he started his campaign and began talking about immigrants, Mexico, and Mexicans, I said 'I've got to get this guy,” Linares told Reuters. At least three different dolls with some resemblance to the politician have been noticed by the media across the country – one of them in Monterrey, another in Puebla and the third in the country’s capital, Mexico City. — La Razón de México (@LaRazon_mx) 26 марта 2016 г.
Mexico City’s Trump was stuffed with fireworks and set on fire, but refused to explode immediately. It took at least two attempts to destroy the effigy, witnesses report. — David Agren (@el_reportero) 27 марта 2016 г. US President Barack Obama was also on this year’s Judas list too. 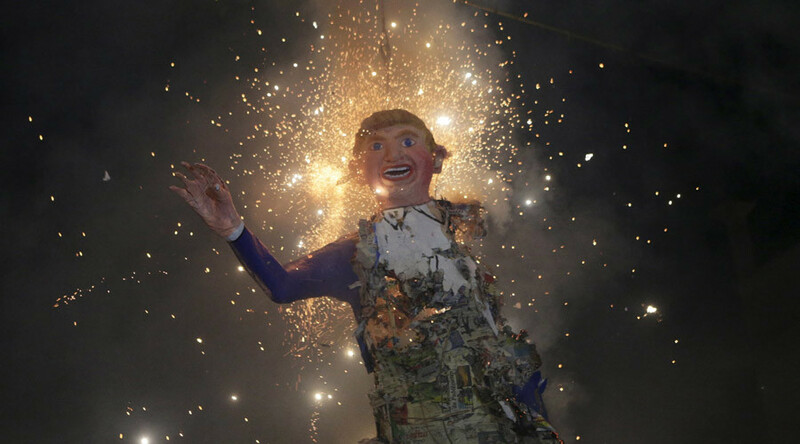 Mexicans have a history of vengeance on Donald Trump: they have previously manufactured cardboard copies of the politician to use them as piñatas.